The unfortunate evil act of the Las Vegas Shooter, now known as Stephen Paddock, is once again fueling debate on social media and beyond about whether the issue of gun control needs to be revisited. 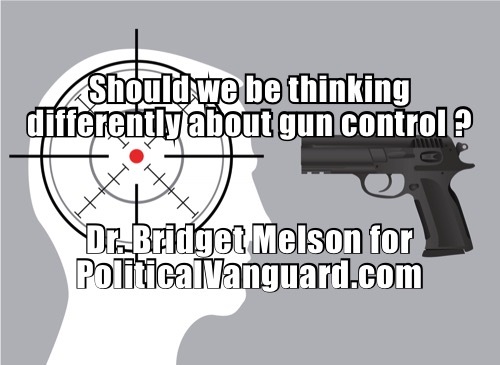 Various power-hungry politicians, who are either armed themselves or who have armed bodyguards, along with overzealous television personalities, some of whom parade around on film using high powered firearms none of us would ever dare to fire, are demanding “gun control.” Paradoxically, they want to persuade the general public to fear firearms. On top of all that, we have pop culture television psychologists weighing in on why Paddock carried out this atrocity and about his supposed motivations. They want you to believe that he bought the guns legally and passed a background check, and that anyone who does that is capable of committing heinous crimes. Not satisfied with just that, they have presumed his religion, his upbringing and his clinical diagnosis of “narcissist” and “mentally instability.” And let’s not forget that based on his background, they all of a sudden “know” his political affiliation—everything from far right, to alt left, to never voted. The assumptions are never-ending. It makes me want to jump through the television screen when these psychological talking heads start spewing psychobabble nonsense in an attempt to further their agenda of power and control. As a licensed psychotherapist in two states, who has been in the psychological field for over 25 years, as well as a conservative political activist who has worked with politicians, I have dedicated my time to researching the potential effects of stricter gun law policy and whether or not there is a strong correlation between it and mental health evaluation. Presently, there is not viable evidence to support that what we are experiencing has anything to do with mental health and instead has more to do with the heart of man, and quite frankly, I am outraged at the non-truths and outright lies being used. At the heart of this country lies a problem deeper than what the progressives want to admit; issues of selfish agendas, misplaced and misused power and unquenchable immorality. It honestly goes back to an old-fashioned battle between right and wrong, if not good and evil. Under the guise of “mental health issues,” they will attempt to convince even the staunchest of conservatives, that these “issues” are the final end to justify the means of passing tougher gun laws. Not only is this an insult to my clients, but also to anyone who has ever suffered even a bout, let alone a lifetime, of depression, anxiety, PTSD or any other emotional issue—and I will fight this battle to the end. For the politicians, this is about power. Don’t forget that the previous administration ruled that any person who received Social Security benefits for a psychiatric disability would be added to the FBI’s list of people ineligible to purchase firearms. In California, a relative has the power to petition a court to have someone’s guns take away, at least temporarily, based on a claim of mental instability. It seems today that if you have ever had a need to take a leave of absence, are enduring an emotional time in your life, or are experiencing moderate emotional disabilities—such as depression or anxiety–your constitutional rights are at risk. Let’s look at some of the tactics and lies of the Left that drive me insane (pun intended) and expose the truth of their agenda. Lie #1. Restricting 2nd Amendment rights of depressed people will end suicidal ideation and suicide by firearm. False. First, suicidal ideation, or suicidal thoughts, do not begin with nor are they subject to gun control. I can tell you as a professional in this field–taking away a person’s right to bear arms will not stop suicidal ideation. Second, the most common methods of committing the act of suicide are hanging, overdose, cutting, or jumping, with suicide by firearm being farther on down the list. An additional note: 50% of those that get to this decision process of taking their own life, are actually content because of their decision and show no signs of depression or anxiety. As such, a mental health evaluation is not even always effective even if they get an exam, which most don’t. Lie #2 Restricting 2nd Amendment Rights will end serial killings. False. The typical profile of a serial killer is a white male, mid to late 20’s, charming, average intelligence, power hungry, egotistical (narcissist), and a master manipulator. Evil? Yes. A psychopath? Yes. Detectable via a mental health exam? Rarely. They are charmers nonetheless and they usually go undetected because they want to stay under the radar. They don’t walk into stores to fill out background checks nor do they seek a mental health evaluation before purchasing a gun…and…they rarely use firearms to kill their victims. In other words, gun control will have almost no effect on serial killers. Lie #3 Banning firearms will end murder by gunfire. False. Case in point Chicago—a city with some of the toughest gun laws in the country, where nearly 2900 people were shot as of September, 2017. Of those, there were 488 shooting deaths. Of those murders, less than 3% were from guns purchased legally. Adding additional laws will not change that number. Lie #4 Enforcing tougher gun laws and infringing upon our Constitutional rights will end mass shootings and murder by firearm. False. According to an interview with arrestees, “56% said they paid cash on the street for a firearm, 15% said it was a gift; 10% said they borrowed it; 13% said they either traded for it or stole it.” They do not walk into gun stores, fill out a form, take a quiz and wait their allotted time to receive a firearm. They are not our typical law-abiding citizen. So why are we punishing good Americans for their illegal behavior? Lie #5 Tougher gun laws created to shut down firearm retailers will eliminate mass shootings and other firearm related crimes committed by the mentally unstable. FALSE. In a recent study by ATF officials, it was reported that only 8% of the nation’s 124,000 retail gun dealers sell the majority of handguns that are used in crimes. Thus, the remaining 92% have thus far proven to have sold firearms to mentally stable and responsible customers with no history of gun violence or lawlessness—including mass shootings. Lie #6 Tougher gun laws will end radicalization which is a form of mental illness. FALSE. Individual radicalization is caused by multiple factors personal and collective, as well as psychological and social. It has been found to be less of a mental issue and more of an issue of the heart and a result of a depraved mind, not a mentally unstable mind. It is certainly not dependent on access to guns. Firearms do not leap off of shelves or out of gun safes by themselves. Bad people who have acquired firearms illegally and/or have chosen to commit an evil act which leads to mass shootings and murder rampages by firearm, kill—and they are few and far between. Good, moral upstanding people who own and use firearms responsibly dwarf the numbers of those that do not. Anti-gun groups need to distinguish those facts from their distortions. Stephen Paddock certainly was not in his right mind or heart for that matter. It is also true that he came from a family where psychopathological behavior was present. That is not debatable. Yet, we must realize that there are vast differences between the depravity of psychopathological behavior—which is extremely rare—and mental illness. Were there signs of his instability enough to warrant investigating him further to determine whether he was a threat to society? At this point, we do not know. Yes, his father was a criminal. We can also argue in hindsight that Paddock should have therefore been on an FBI watch list if they believed that genetic components were relevant. In truth, local law enforcement knew of him but were not concerned and he was not on any FBI watch list. FACT: there is no way to prove that stricter gun laws would have stopped Paddock from carrying out his atrocity. Paddock, by his own choice, broke numerous laws that day. Creating more laws would not have stopped him but instead would only punish law abiding citizens. Banning guns will not solve the issues at hand. This was an act of pure evil. I will not even give credence to the fact that many are saying this man was simply “mentally unstable”. Mental instability does not look like this. Evil does. And if “evil” people want to access a gun or modify them in any way, they will find a way. Banning firearms, even restricting devices to modify them such as the bump stock—which I am not opposed to restricting–from law abiding citizens so they have no way to defend themselves will not fix that either. Addressing America’s heart issue is our only chance. Addressing our indifference to life must begin. Don’t forget, that the internal battle between good and evil has been around long before firearms were even in existence and it’s not going away any time soon. With that, I can confidently say that additional gun laws will not end this battle. We as Americans all deserve life, liberty, the pursuit of happiness and to have the rights outlined in the Constitution, including the right to bear arms. When a very small percentage of fringe unpatriotic Americans who succumb to the voice of their inner demons, attempt to destroy the very foundation of this country, we need to rise up in support of those affected. We need to pray more than ever. We need to educate our children. We need to fight to keep our God given rights, and lastly, we need to find solutions that do not infringe upon those rights. May we keep fighting the good fight, love one another, and support our politicians who truly have every American’s best interest at heart.